A press release today from Colorado Ethics Watch announces that group's request for an investigation by the U.S. Office of Congressional Ethics of GOP Rep. Mike Coffman, citing what they consider excessively heavy–and excessively political–use of the so-called "franking privilege," or free mailings to constituents that aren't supposed to be related to electioneering. Today, Colorado Ethics Watch asked the Office of Congressional Ethics to determine whether Rep. Mike Coffman (R-CO) abused the Congressional franking privilege, using tax dollars to support his re-election campaign. Between January 2013 and the present, residents of Colorado’s 6th Congressional District have been receiving unsolicited “Official Mail” from Rep. Coffman, which has cost the taxpayers in excess of $260,000. Ethics Watch’s request asks the Office of Congressional Ethics to investigate evidence that the majority of the unsolicited mass mail is for political rather than official purposes, noting that the timing and increased frequency is likely in response to Rep. Coffman having a challenger for the 6th District, former Speaker of the Colorado House Andrew Romanoff. Before the race became competitive, Rep. Coffman used the franking privilege properly to communicate information about services and specific accomplishments as a Member of Congress. After the race became competitive, Coffman went from being Rep. Coffman to candidate Coffman. Instead of talking about specifics, the mail turned into campaign pieces meant to persuade the reader. “If you compare the pieces of mass mail the Congressman sent before he had a legitimate opponent for CD-6 and after he had a competitive race with the entry of Romanoff, it does not pass the smell test,” said Luis Toro, Director of Ethics Watch. “Any reader who compares the pieces, as the Congressional Franking Commission should have, can tell when Congressman Coffman changed his tactics." Coffman's total expenditures on franking communications with his constituents since 2013 appear to be well in excess of the average among members of Congress who send mass mailings at all (only 80% or so do accounting to the Congressional Research Service). But in addition to that, Ethics Watch says the content of Coffman's taxpayer-funded mailings is unacceptably close to Coffman's campaign message materials for re-election. The fact is, most members of Congress take advantage of the franking privilege. 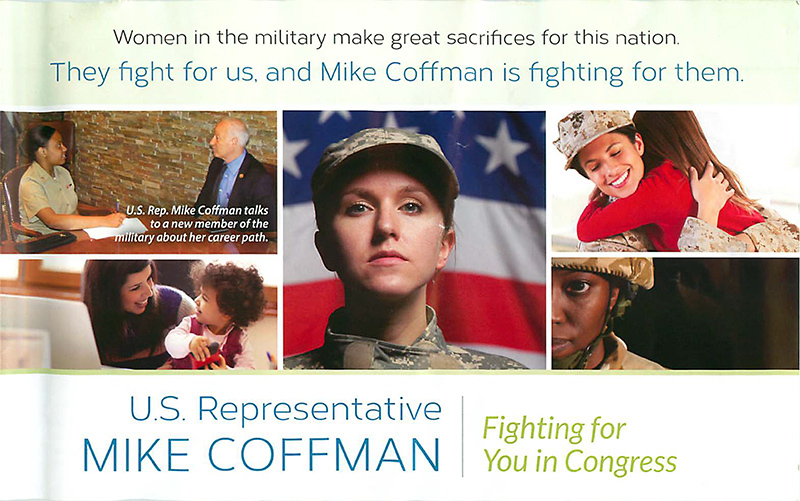 But the combination of Coffman's far heavier use of taxpayer-funded mailings since his district became more competitive in the 2011 redistricting process, with what certainly looks to us to be a straightforward election-season message…well, yes. We could see the Office of Congressional Ethics reasonably taking an interest in this complaint. Even if they don't, or more likely don't before the election, it's another bit of evidence of Coffman's deep concerns about survival in a district that no longer fits his brand of beet-red conservative politics. Coffman barely stayed alive in 2012 against a comparatively weak opponent, and even with a major PR offensive with his new constituents, 2014 is looking like the fight of Coffman's political life–with a very good possibility of unemployment in January. Obviously, if the PR offensive itself becomes a scandal, that won't help. Translation: "It's ALL potentially illegal public spending and an outrageous waste of taxpayer money by evil Washington politicians — except when I'M the Republican politician doing it. Then…freedom!" Shame on you, outgoing Rep. Michael Coffman. Give us five hundred weird-looking DIA non push-ups — NOW! 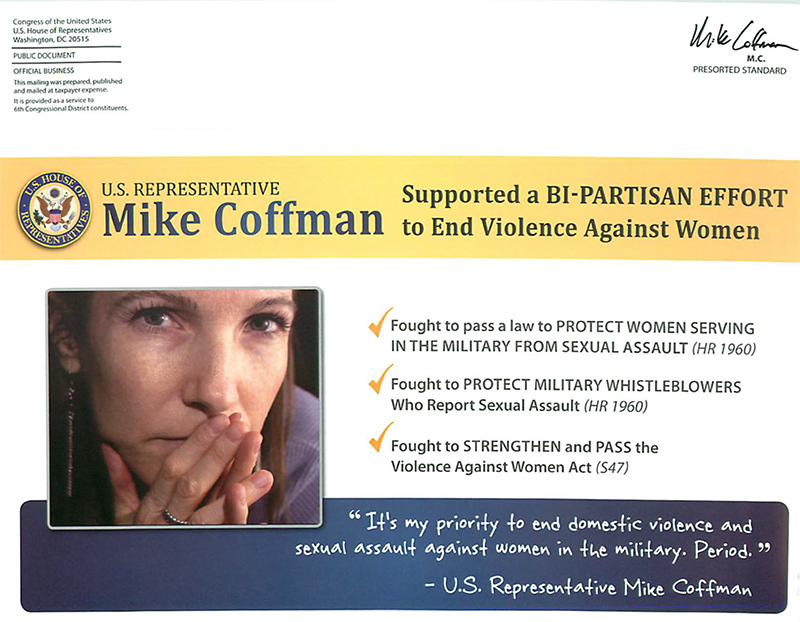 My favorite campaign literature from Coffman was the ridiculous mailer listing all the legislation he'd sponsored. None of which had actually passed, of course, but you wouldn't know that from the mailer.